Adrafinil by Absorb Health Ignite Your Mental Acuity with One of the Most Powerful Cognitive Enhancers on the Market Today, Adrafinil by Absorb Health! Alpha Brain by Onnit Labs Improve your memory, focus, processing speed, and flow state with Alpha Brain by Onnit Labs! 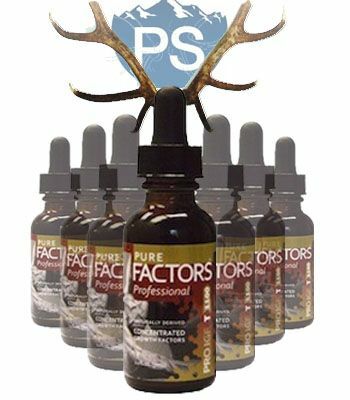 Pure Factors Pro IGF T1100 is the highest dosed Deer Antler Velvet product on the market, designed to aid in recovery, anti-aging, muscle endurance, libido health, and improved immune function. Suggested Use: As a dietary supplement, hold 30 drops in mouth for 90 seconds per dose. Swallow afterward. For best results, use in the morning on an empty stomach. You may need to adjust dosage based on body weight and diet. In order to grow and recover you need to keep one factor in mind...The Growth Factor! Time waits for no man. Everyone knows we can't stop time nor turn its hands back. But we can change the way in which it affects our body! The aging process not only leads to a decrease in hormonal production but can accelerate the breakdown of the Insulin-like Growth Factors (IGF), which can have several negative effects on the human body. Until now! Age like wine by supplementing natural Insulin-like Growth Factors into your daily diet with Pure IGF T1100, featuring a massive 36.7mg of Velvet Antler Extract! Pro IGF T1100 by Pure Solutions is designed reverse the negative side effects associated with of lowered IGF production with the use of Deer Antler Velvet Extract! Pro IGF T1100 contains high potency extracts of these natural occurring growth factors, providing your body with essential raw materials need to regulate growth of muscle tissue rapidly. You may be asking yourself, why are other deer antler products so cheap? That is because you get what you pay for. Most other deer antler products just use ground up deer antler with very little extract. Pure Solutions uses a patented extraction process that uses a 43:1 extract and only the tips - what that means is in 43 lbs of antler raw material they eliminate 42 pounds of bone, hair, and cartilage to give you pure Velvet Antler Extract. You get the good stuff, and a whole lot of it! Look better. Feel better. Perform better. Take time by the hands and control the rate in which you age! What does Pro IGF T1100 Support? What are the active compounds in Pro IGF T1100? Velvet Antler Extract: Many studies show that velvet from elk and deer antlers have many medical benefits. Deer antler velvet is an essential growth hormone called IGF-1. Growth hormone is naturally produced by the brain and liver, and determines how much our body's grow. IGF-1 is a key factor in how the body repairs itself. Athletes and fitness enthusiasts use deer antler as a performance enhancer, it is believed to heal cartilage and tendon injuries faster. It is also said to help increase endurance and strength while training. Velvet Antler is very promising in helping increasing recovery time. This ingredient is also known help people who suffer from dwarfism and stunted growth. Tribulus: The most common and effective test boosting ingredient on the market. Tribulus is a herb that has been used in traditional medicine for many decades. The active compound in tribulus are called steroidal saponin, which are primarily found in leafs. Tribulus will help boost your body's natural testosterone levels which will lead to an increase in libido as well as help build muscle mass. Tribulus is often used for erectile dysfunction and low libido. Tribulus works by increasing luteinizing hormone DHEA.